نوابی, محمد, داودی, علی. (1397). مدل سازی و کنترل تلاطم سوخت و اثر آن روی وضعیت فضاپیما. علوم و فناوری فضایی, 11(4), 11-22. محمد نوابی; علی داودی. "مدل سازی و کنترل تلاطم سوخت و اثر آن روی وضعیت فضاپیما". علوم و فناوری فضایی, 11, 4, 1397, 11-22. نوابی, محمد, داودی, علی. (1397). 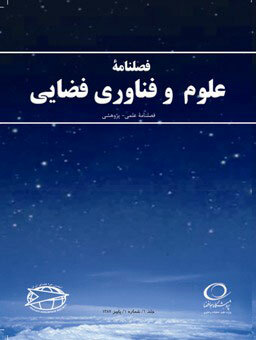 'مدل سازی و کنترل تلاطم سوخت و اثر آن روی وضعیت فضاپیما', علوم و فناوری فضایی, 11(4), pp. 11-22. نوابی, محمد, داودی, علی. مدل سازی و کنترل تلاطم سوخت و اثر آن روی وضعیت فضاپیما. علوم و فناوری فضایی, 1397; 11(4): 11-22. سوخت موجود درمخزن فضاپیما در حین انجام مانور مداری دچار پدیده تلاطم می­شود و این پدیده روی وضعیت فضاپیما اثر نامطلوبی می‌گذارد. بنابراین باید قبل از انجام مانور­های مداری تلاطم سوخت مدل­سازی و روشی مناسب برای کنترل آن انتخاب شود. در این مقاله به مدل‌سازی دینامیک تلاطم با استفاده از مدل دو پاندولی در فضای دو بعدی پرداخته شده است. مانور فضاپیما و حرکت پاندول­ها در صفحه در نظر گرفته شده و بنابراین سیستم فضاپیما و پاندول­ها سیستمی پنج درجه آزادی خواهد شد. برای پایدار سازی معادلات دینامیکی سیستم معرفی شده هم از کنترلر­های خطی (کلاسیک و LQR) و هم از کنترلر­های غیرخطی (لیاپانوف و فازی) استفاده شده است، که البته برای استفاده از کنترلر­های خطی معادلات دینامیکی با استفاده از تقریب مناسب خطی شده­اند. نتایج شبیه سازی موفقیت آمیز بودن کنترلر­های طراحی شده بر روی وضعیت فضاپیما و پاندول­ها را نشان می‌دهد. Sloshing phenomenon in spacecraft fuel tank during orbital maneuver, causes adverse effects on spacecraft attitude. Therefore, before orbital maneuvers, modeling fuel sloshing and determining appropriate method for controlling it has to be carried out. The aim of this paper is to model slosh dynamics by using double pendulum model in two-dimensional space. Spacecraft maneuver and pendulums motion are considered in 2D-coordinate, so coupled spacecraft and pendulums dynamic system are 5 degrees of freedom systems. Here, linear control methods (PD and LQR), and also nonlinear control methods (Lyapunov and fuzzy) are determined to stabilize dynamic parameters of the introduced system. Simulation results show that designed controllers have good performance to achieve stabilization of the parameters. Deng, M., Baozeng, Y. and Jiarui, Y., “Position and Attitude Control of Spacecraft with Large Amplitude Propellant Slosh and Depletion,” Journal of Aerospace Engineering, Vol. 30, Issue 6, 2017, pp. 1-12. Pukdeboon, C. and Kumam, P., “Robust Optimal Sliding Mode Control for Spacecraft Position and Attitude Maneuvers,” Journal of Aerospace science and Technology, vol. 43, 2015, pp. 329-342. Meirovitch, L. and Kwak, M. K., “State Equation for a Spacecraft with Maneuvering Flexible Appendages in Terms of Quasi-Coordinates,” Applied Mechanics Reviews, Vol. 42, Issue 11, 1989, pp. 161-170. Peterson, L. D., Crawley, E. F. and Hansman, R. J., “Nonlinear Fluid Slosh Coupled to the Dynamics of Spacecraft,” AIAA Journal, Vol. 27, No. 9, 1989, pp. 1230-1240. Hung, R.J., Long, Y.T. and Chi, Y.M., “Slosh Dynamics Coupled with Spacecraft Attitude Dynamics Part1: Formulation and Theory,” Journal of Spacecraft and Rockets, Vol. 33, No. 4, 1996, pp. 575-581. Vadali, S. R., “Variable-Structure Control of Spacecraft Large-Angle Maneuvers,” Journal of Guidance, Control, and Dynamics, Vol. 9, No. 2, 1986, pp. 235-239. Shageer, H. and Tao, G., “Modeling and Adaptive Control of Spacecraft with Fuel Slosh: Overview and Case Studies,” AIAA Guidance, Navigation and Control Conference and Exhibit, AIAA 2007-6434, 2007, pp. 1-19. Sidi, M.J., Spacecraft Dynamics and Control, a Practical Engineering Approach, Cambridge University Press, 1997, pp. 291-316. Hill, D.E. and Baumgarten, J.R., “Control of Spin-Stabilized Spacecraft with Sloshing Fluid Stores,” Journal of Dynamics Systems, Measurement, and Control, Vol. 114, Issue 4, 1992, pp. 1-4. X. Yu, S. and R. Yun, Q., “Using Sliding Mode Control Method to Suppress Fuel Sloshing of a Liquid-Filled Spacecraft,” 27th Chinese Control and Decision Conference, 2015, pp. 1268-1273. Cho, S., McClamroch, N. H. and Reyhanoglu, M., “Feedback Control of a Space Vehicle with Unactuated Fuel Slosh Dynamics,” AIAA Guidance, Navigation, and Control Conference, 2000, AIAA 2000-4046, pp. 354-359. Bandyopadhyay, B., Gandhi, P.S. and Kurode, S., “Sliding Mode Observer Based Sliding Mode Controller for Slosh-Free Motion Through PID Scheme,” IEEE Transaction on Industrial Electronics, Vol. 56, No. 9, 2009, pp. 3432-3442. Souza, A. G. and d. Souza, L. C. G., “Design of Satellite Attitude Control System Considering the Interaction Between Fuel Slosh and Flexible Dynamics,” 11th International Conference on Vibration problems, 2013, pp. 1-10. Ibrahim, R. A., Liquid Sloshing Dynamics, Theory and Applications, Cambridge University Press, 2005, pp. 296-334. Reyhanoglu, M., “Maneuvering Control Problem for a Spacecraft with Unactuated Fuel Slosh Dynamics,” IEEE Conference on Control Applications, 2003, pp. 695-699. Reyhanoglu, M. and R. Hervas, J., “Nonlinear Control of a Spacecraft with Multiple Fuel Slosh Modes,” Conference on Decision and Control and European Control Conference, 2011, pp. 6192-6197. R. Hervas, J., Reyhanoglu, M. and Tang, H., “Thrust-Vector Control of a Tree-Axis Stabilized Spacecraft with Fuel Slosh Dynamics,” International Conference on Control, Automation and Systems, 2013, pp. 761-766. R. Hervas, J. and Reyhanoglu, M., “Observer-Based Nonlinear Control of Space Vehicles with Multi-Mass Fuel Slosh Dynamics,” IEEE International Symposium on Industrial Electronics, 2014, pp. 178-182. Cho, S., McClamroch, N. H. and Reyhanoglu, M., “Dynamics of Multibody Vehicles and Their Formulation as Nonlinear Control Systems,” American Control Conference, 2000, pp. 3908-3912. Reyhanoglu, M., Van der Schaft, A., Kolmanovski, I. and McClamroch, N. H., “Dynamics and Control of a Class of Underactuated Mechanical Systems,” IEEE Transaction on Automatic Control, Vol. 44, No. 9, 1999, pp. 1663-1671. Zhao, Z., Tomizuka, M. and Isaka, S., “Fuzzy Gain Scheduling of PID Controllers,” IEEE Transaction on Systems, Man, and Cybernetics, Vol. 23, Issue 5, 1993, pp. 1392-1398.